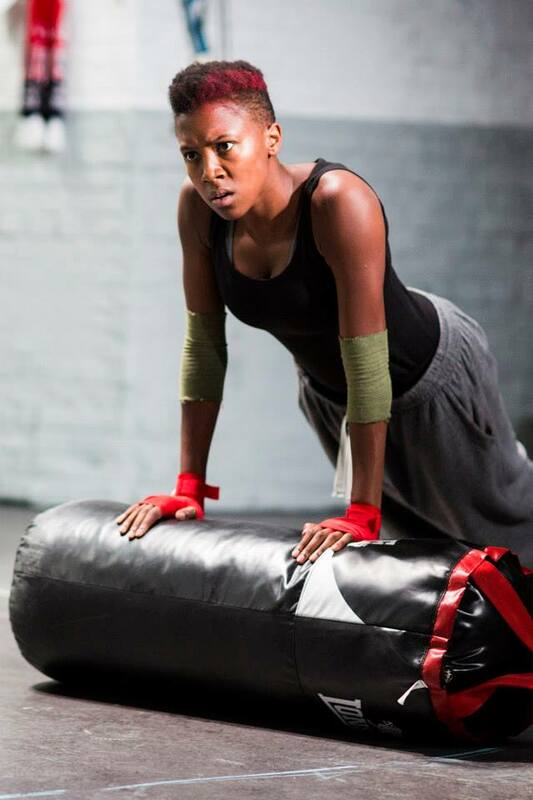 So here we are back at the Donmar Warehouse, back in a Phyllidia Lloyd production, back in prison, back with an all-female cast and, sadly, back to howls of protest emanating from the comment boards. 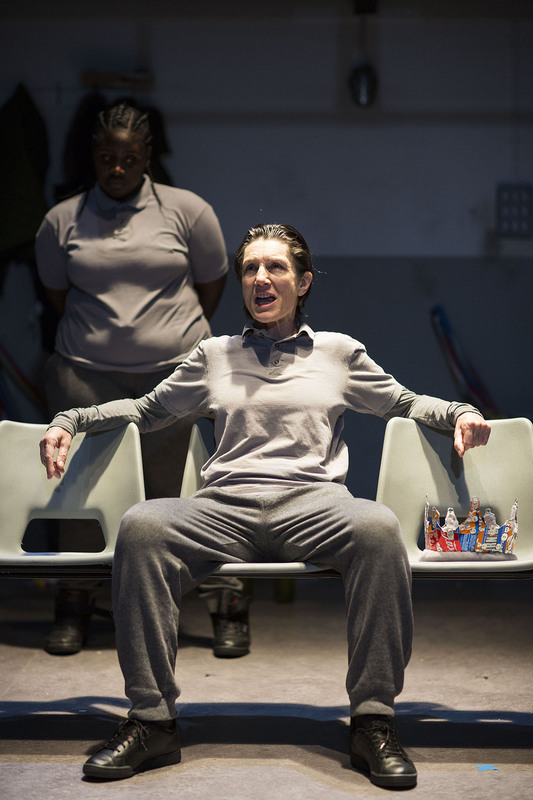 Despite the compelling evidence of last year’s Julius Caesar for the benefits of seeing women perform ‘male’ roles, including Harriet Walter putting in the performance of the year as Brutus, little seems to have changed and so the old arguments have been dusted off and trotted back out. To incite further ire Phyllidia Lloyd has radically altered Shakespeare’s original text. This is not a snip here, a cut there. This is Henry IV Parts I and II, totalling almost six hours of performance, smashed together and pared down to 120 minutes. That really is an audacious move. It is also a smart one. May directors have discovered how difficult it is to change Shakespeare by working around the fringes; if you are looking to show something new within something old then far better to prune the excess foliage until what is obscured below is revealed. Shakespeare’s talent did on occasion lead to an explosion of brilliance, his imagination working so fast that one play can contain more plot strands than most writers can work into several; this is his genius but the audience, unpicking the complexity of plot and language, can lose focus on anything that isn’t centre-stage. In Henry IV productions almost all exclusively focus on the Hal/Falstaff dynamic; it is the interesting complexity of the prince we know will become the near-mythic Henry V, and his relationship with the greatest tragicomic creation of his age. However in Lloyd’s reduction we see this become a play that focuses on the dynamics of a father with two sons, and a son with two fathers. With Harriet Walter as the dying king it makes sense to ensure that the most is made of an actor of her calibre. 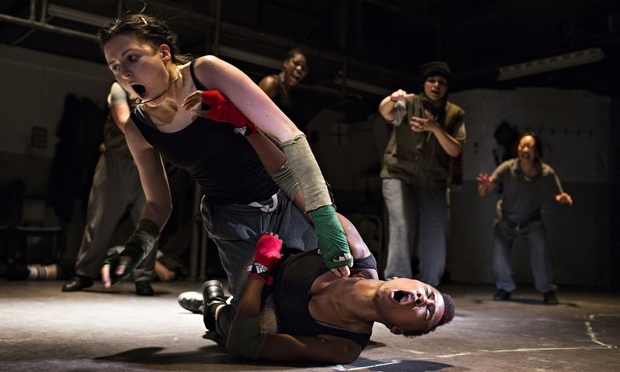 By barely cutting Henry IV’s lines, it makes the role far more central to the play. Much of Falstaff’s activities outside of Hal’s orbit are cut and this results in a balancing of Falstaff and Henry IV and creates two much clearer allegiances for Hal. The resulting time is given over to the rebels, and in particular Jade Anouka’s sparky Hotspur – a brilliant performance that brings to vivid life Frank Kermode’s description of Hotspur’s lines being ‘anti-poetry, a contempt for poetry as flummery and affectation’. By stripping the text it aligns Hotspur and Hal as the son the king wished he had and the son that he wished he hadn’t. It also allows room for Hotspur’s wife, Lady Percy (Sharon Rooney), to shine. The scenes with her husband and mourning his death are often lost amid the action but here they are in focus and Rooney gives a heartbreakingly tender performance of someone who loses a husband and then desperately seeks to avoid losing a father. Lloyd invites criticism by going back to the prison setting; the outside touches do not always work, the slightly comic props may be appropriate for the location but are at odds with the seriousness of the endeavour. However these lapses are mostly forgiven by the power the setting has on the rejection of Falstaff. ‘I know thee not, old man…’ is so well known that while it may still move us it has become something expected, and whilst we witness the action we no longer understand the action as it relates to the character. Actively awaiting the moment we can neither comprehend the extent to which Falstaff is unprepared for it nor the struggle that it must be for Hal to reject the man who has been his father. This is not an easy decision; the confines of the prison hierarchy mean these structures carry power and are arguably more closely resemble the ties that kept people together within the medieval world than any other modern settings can achieve. The power of the rejection can be heard in Falstaff’s (Ashley McGuire) guttural cry of anguish and the thin strip that separates love and hate dissolves, the real world streams in and a riot is near enacted. 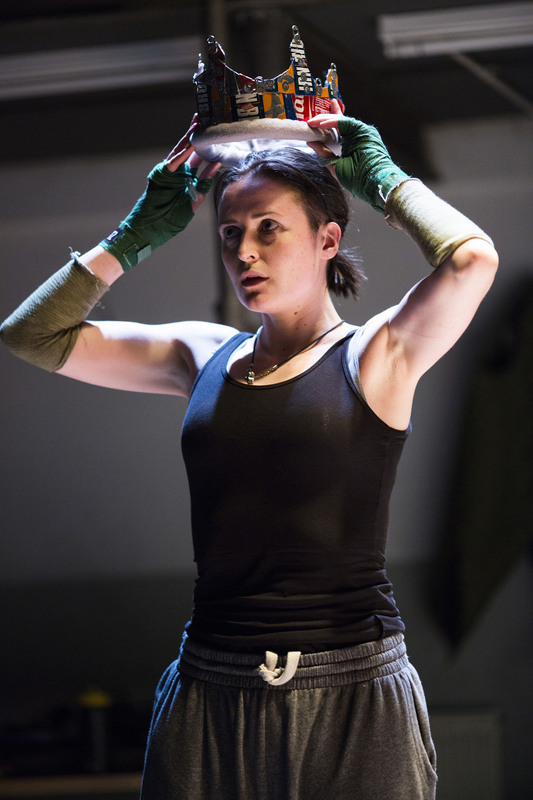 Harriet Walter’s Henry IV, often keeping to the balcony as a literal reminder of status, is a magnificent performance. Her angular, gaunt face captures the haunted nature of the dying king and the despair in the son that will follow. However this is not a weak, ineffectual king, this is not a king who is a background performer in his own drama. Walter’s articulation of the Bolingbroke who broke a former king and who held together a country until death is expertly handled in her description of becoming a monarch who ruled “By being seldom seen, I could not stir / But like a comet I was wonder’d at; /That men would tell their children ‘This is he;’ / Others would say ‘Where, which is Bolingbroke?’/ And then I stole all courtesy from heaven, /And dress’d myself in such humility/ That I did pluck allegiance from men’s hearts,’” and we understand with her counterpoint to the ‘skipping king’ the road that was taken is the same that Hal must find. The performance is superb, the best King Henry IV by some distance that I’ve experienced, and cements Walter’s position as one of our foremost Shakespearians of either gender, endowed with a precision and intelligence that can meet and display the genius of his writing. The other standout performance, Anouka’s Hotspur, couldn’t be more different. It is a challenging combative performance. It holds little truck with the rhythms we have come to expect from Shakespeare but it fits the character. Hotspur is a bundle of energy, words are spit out at a breathless pace, ideas do not sit in the head but are delivered as they arrive. The splitting of the kingdoms is evidence of Hotspur’s ability to turn even a peaceful, celebratory affair into a fight. This is not a perfect production; some of the performances around the edges are a little rough, Clare Dunne’s Hal never quite convinces until the end and the scenes in the Boar’s Head struggle to match the power of those in court and with the rebels. It is also problematic that many people are waving the banner of feminism above this production. It should not be seen as a feminist production just because it has an all-female cast. Julius Caesar clearly demonstrated that female performers could provide new insights into old dialogue but in Henry IV the more radical and important element is the extent to which Lloyd has taken apart the play in order to bring out relationships and dynamics that are often smothered by the density of the plotting. Lloyd’s radical streamlining demonstrates a fearlessness to the text that will put her in the firing line of the traditionalists. If the direction does not always work this does not undermine her decision; Lloyd has put something onto the stage that remains undoubtedly Shakespeare whilst simultaneously seeming entirely new. It is a superb example of challenging theatre because it does so by challenging the established rules and traditions whilst remaining inside the system and using the rules and formats that were set down by those in power. Ignore the naysayers this production is a most refreshing change.